A huge coup and a great treat for viewers was confirmed today. 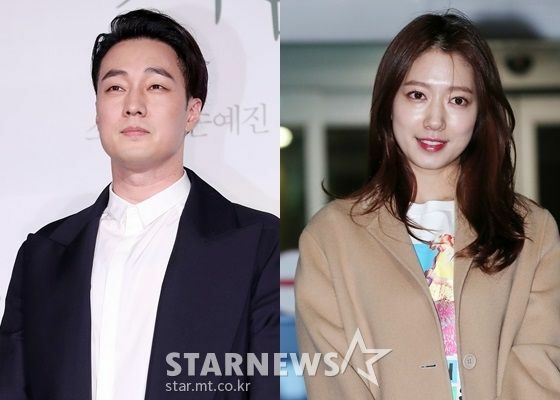 Park Shin Hye and So Ji Sub are going to do Na PD’s next variety show for cable network tvN! She’s guest starred on his varieties before and the last one I watched was Three Meals a Day where she showed off plenty of surviving on own cooking skills.I don’t recall watching So Ji Sub in any varieties but he’s the quirky type that totally can entertain with the right PD behind the lens with a great eye for editing. Currently Park Shin Hye and So Ji Sub are on Jeju Island filming the new Na PD variety show Little House in the Woods which places the stars completely off-grid in a house with no electricity. They have to generate their own electricity and also cook their own meals. This is going to be so much fun, can’t wait! Na PD really like Shinhye it seems… And So Jisub omg. I loved him when he appeared on Infinite Challenge. So happy to know he’s now a fixed cast on a variety program, with Na PD no less. This would be great promotion for their upcoming dramas. they dont match. she going look like a kid next to Ahjussi SJS. why pair a man woman who 10+ year apart. should pair her up with her real bf so we can see their love on air. This is a Variety show. Do they have to match? Have you watched Variety show by PD Na before? Geez… what a shallow comment!! Talk like you she will have to work with her bf in all her work? Now we just need Yoo Seungho as a guest to round up the reunion. Omgosh I need that to happen! Absolutely loved the MV where SJS invited PSH and YSH to starred in his MV! They definitely need a reunion! Yay!!! Love this pairing and PD Na. Great concept too. Little House in the Woods sounds like a British folklore story turned into a live action movie. Na PD is very good at directing things like this and seems like he really liked working with Park Shin Hye. I’m curious to see her reunion with So Ji Sub. Although dramas are PSH’s bread and butter, she should really consider taking movies and choose tvn or ocn dramas, either no romance or a full blown romance drama. None of that high schooler bs anymore. Come on, I know she’s capable. And So Ji Sub.. I gladly want to forget Oh My Venus. He should comeback with a tvn drama too.. nowadays public broadcast channel dramas have so many problems and tvn is getting all the a-listers anyway. Personally, it would have been great to see So Ji Sub and Son Ye Jin in a variety together. He is more into business and less into acting for past few yeras. He said he finds acting in a drama tiring and prefers more cheerful roles because sad roles affects his mood. @prettyautmn I don’t think he has to be a chaebol to be a cheerful character. He looks like a sensitive and introverted person and some of his crazy fangirls affected his life in the past so can’t blame him for thinking that way. It’s a strange pair up I think. Is it just 2 of them or there are other cast members. SJS is not much of a talker…..though I’ll trust PD Na. It’s a coup to land both of them because you hardly see them in variety. SJS has worked with Park Shin Hye earlier. He casted her with Yoo Seung Ho(mostly to full-fill YSH’s pre-enlistment wish to work with PSH.😉) in one of his hip-hop EP. If Hyun Bin rejects Fox Bride Star, I want the production team to offer Yoo Seungho the role. It would be great to see YSH and PSH together in a drama. Yoo Seung Ho and Park Shin Hye didnt happen in real life, i really want a amazing drama together. So exciting… My queen is back! Shin Hye is back! So love the paring! My wish for a drama or movie sometime in the future, after this ! Yes! In PD Na we trust! Too bad PD Na is more towards varieties! I wish he could tackle dramas one day. I would love to see his skills in that category! Love how he casted PSH and SJS as his first guest to his new variety show! It would be a great idea to add YSH as a surprise guest to add to this wonderful reunion! I’m excited to see how this new variety show will turn out! Couldn’t agree more to this. In Na PD we trust! Are you sure they are just guests? I have been rewatching 3 meals a day in youtube, the one which has Park Shin Hye in it. She’s got a cook hands and I love watching her cooks. She makes cooking looked so much easier. This sounds like heaven! Na PD is a genius, and SJS knows PSH, so he won’t be too shy around her. Perfect. Just perfect! He cooks, she cooks very well, it will be so much fun to see them master the difficulties of producing electricity. Can’t wait! Interesting pair and concept! Na PD has the touch of Midas so I’ll definitely check this out. Park Shin Hye is Na PD’s favorite guest per his interviews. She can cook, build an oven, etc..in short a domestic goddess besides able to sing and dance while doing so. She is also witty she shines in this environment, her real personality comes out.To me, she makes ordinary mundane things, chores interesting! Paired with SJS who appears to be more closed ?? would be interesting. Or maybe he has a hidden personality and he’ll surprise us all. Can not for this show! April come soon! Another great news appear and I’m so excited about this. PSH and SJS it’s one of my dream pair to work together and I’m all in for this varitey show. Honestly I just want March to be over already cause I really can’t wait to see my dream pair on full screen. SJS going bore people. if he stick to how he act in drama. hopfully they dont try to romance these 2 together. we already they both take. try to romance these two will kill the rating show. I hope this is the healing project Shinhye has talked about. Please pick a more exciting drama/move project next. Maybe an action drama like Vagabond? Park Shin Hye and So Ji Sub’s 1st variety show in tvN “Little house in the woods” on April 6 at 9.50 pm KST. Hooray! And you guys are going to live in a remote mountain without movie theaters, concerts, delicious cuisine, twitters and… OMG! What a difficult task! Don’t think I can do it without all these modern amenities especially keeping in touch with you Park Shin Hye. “Difficult roads often lead to beautiful destinations.” Park Shin Hye, So Ji Sub, PD Na Young Suk and all the cast and crew of “Little house in the woods” (LHITW) keep going! All your loving loyal fans will be cheering you guys on. LHITW Fighting! Park Shin Hye saranghaeyo!